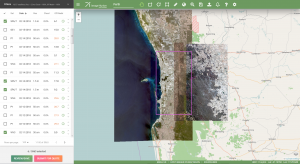 Image Hunter Updates – Our First Aerial Imagery Archive is Live! Have you checked out Image Hunter recently?!?! If not, you should! Listening to the feedback we received on improving imagery search engines over the years, the new version of Image Hunter features a major overhaul to the user interface as well as to the backend architecture. Image Hunter is built on open-source technology so it works on all computers, not just on Windows machines. We slimmed down the user interface to make it easier to find the imagery filters and other available tools. All things said, we really think you will enjoy your browsing experience – plus no other search engine even comes close to the breadth of sensors offered in Image Hunter! Fixed Landsat 7 updates – we hope at least as it seems related to daylight savings time somehow. Added in Hexagon aerial imagery daily updates so we are as current as you can find for this dataset. Fixed our broken date filter (thanks Laurent for finding that!). Restored AW3D DEM searches which were down for about a week. Improved date sorting of Hexagon aerial imagery. Have you checked out Data Alert which lets you define an area of interest anywhere around the globe, the resolution your project requires and the number of months we should keep the alert active? Once an alert is set up, we check for new data over your area of interest every single day, and send you an email when we find coverage that meets your specifications. We have a short YouTube video with directions to set up a Data Alert, check out the second video; and we have written directions for Data Alert here. As you might have seen in past articles, we now feature hourly updates (seriously!) of GaoFen 1/2, GeoEye-1, KOMPSAT 2/3/3A, Pléiades 1, SPOT 6/7, SuperView-1, TripleSAT, WorldView-1/2/3/4 and ZiYuan-3! Online browsing of satellite and aerial imagery from 14 data providers and over 35 sensor systems. Near-instantaneous loading of low-resolution preview imagery with collection date, cloud cover and other key metadata. The ability to define your area of interest by address, coordinates, geometric shape or shapefile/KMZ. Image Hunter can be accessed here all-day and all-night, we are excited to find out what you think about our imagery search engine! So if you have any ideas and/or feedback to improve Image Hunter, please let us know at sales@apollomapping.com or (303) 993-3863. This entry was posted in The Geospatial Times and tagged Aerial Imagery, Image Hunter, image hunter 2, imagery archive, product updates, The Geospatial Times by Apollo Mapping. Bookmark the permalink.